WASHINGTON--(BUSINESS WIRE)-- Acting on recommendations of top national education experts, the federal government Tuesday issued the “Charting A Course for Success: America’s Strategy for STEM Education,” listing participation of all Americans in STEM ecosystems as a top priority. STEM ecosystems unite stakeholders from a variety of community-based organizations -- including formal and after-school education, higher education, business, government, philanthropy, and the non-profit sector -- to cultivate, innovate and work for common goals and actions surrounding world-class STEM opportunities for all learners. The STEM five-year strategic plan, under development for more than a year, is based on input from numerous stakeholders, including educators, business and community leaders, and representatives from all 50 states who attended a June federal STEM Summit hosted by Office of Science Technology and Policy (OSTP) at the White House. The plan identifies three discrete goals: 1) Building strong foundations for STEM Literacy; 2) Increasing diversity, equity, and inclusion in STEM and 3) Preparing the STEM Workforce for the Future. The plan identifies methods for achieving the goals with the formation of STEM ecosystems as the leading strategy. This plan follows a decade of work documenting how STEM is best learned in communities where cross-sector partners are collaborating, learning, and educating together with a national community of practice to facilitate learning, information sharing, and problem solving. Gerald Solomon, executive director of the Samueli Foundation, and Ron Ottinger, executive director of STEM Next Opportunity Fund, are co-founders of the STEM Learning Ecosystem Initiative, now comprised of 65 communities across the nation. “STEM Next Opportunity Fund, which has served as one of the lead funders of this initiative, is pleased to see that the new Federal STEM Strategic Plan recognizes the importance of afterschool and the full ecosystem of organizations that must engage and inspire students towards STEM excellence and success,” Ottinger said. The STEM Learning Ecosystem Community of Practice, now in its fourth year, was patterned after the Statewide STEM Network initiative developed at the Bill and Melinda Gates Foundation under the leadership of Steve Seleznow, who has since left Gates to lead the Arizona Community Foundation. STEM Learning Ecosystems build strong collaborations in schools and beyond the classroom—in afterschool and summer programs, at home, with local business and industry partners, and in science centers, libraries and other places both virtual and physical. Ecosystems strive to enable students to connect what they learn at home, in school and out-of-school with real-world opportunities. TIES is dedicated to making STEM accessible to everyone, especially underserved and underrepresented learners. We do this by connecting stakeholders — educators, funders, community organizations, businesses and government agencies — who, through collaborative partnerships, create meaningful and gainful STEM learning experiences. Our team of consultants provides strategic planning support and guides design, training and implementation across all of our services. Applications to join the STEM Learning Ecosystem Community of Practice will be available in early January on www.stemecosystems.org. TIES invites communities and states to apply. 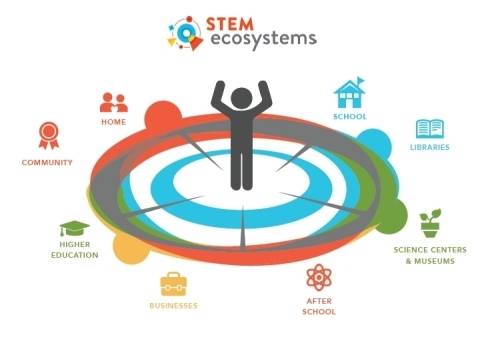 Learn more about STEM Learning Ecosystems national initiative at stemecosystems.org. Address specific questions to info@stemecosystems.org. Join online conversations on Twitter @STEMecosystems and #STEMecosystems and on Facebook. Learn more about TIES - Teaching Institute for Excellence in STEM’s work with STEM Design, Digital Fabrication and Innovation Labs, STEM Talent, and Philanthropy and Social Impact at tiesteach.org. Join the online conversation on Twitter @tiesteach and Facebook /tiesteach.